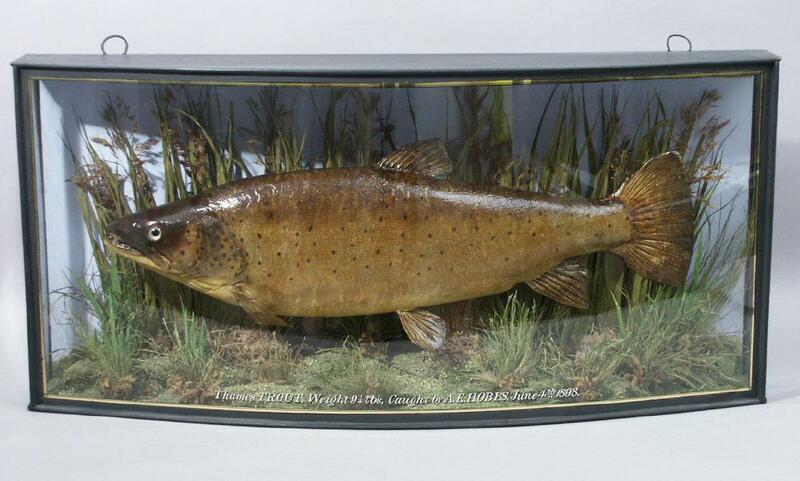 Preserved and cased Thames Trout fish, caught by AE Hobbs in the River Thames on the 4th June 1898. Weight 9.25 lbs. Colour - It is usually brownish or greenish with a darker back but the colour is variable. Greyish blue specimens occur and some are almost black. Size - Growth is dependent on the surroundings and adults are often between 20-50m long. Trout can grow up to 140cm (55ins) long. Charcteristics - The trout has many black spots on its head and body and some red spots. Its lower jaw is long and in old males becomes hooked. The younger trout are called parr and have around 10 marks (called parr marks) on each side of the body. Habitat - The trout likes clean rivers which are high in oxygen. Diet - It feeds on invertebrates, fish and crustaceans. How fished for - Trout are today more often caught from stocked lakes than rivers such as the Thames.